It’s unusual to find that I don’t like new buildings or modern urban-landscape projects in Copenhagen … I even like Ørestad with its raised metro track and its sense of being a Danish Metropolis. It’s not that I’m uncritical but at the very least I can usually see and usually understand if there were problems or constraints that meant some parts of a new development were and are a compromise. That’s why, after walking around the first stage of the massive redevelopment of the Carlsberg brewery site … a new campus for University College Copenhagen along with what are presumably commercial office buildings immediately north of the new Carlsberg suburban railway station … I just felt perplexed about why my initial reaction was not positive. I hoped it was just because that first visit was on a wet grey Sunday afternoon. So I have been back several times to see if it looks different with more people around or looks different at different times of day. It’s not bad compared with commercial developments in other cities … just that it’s as bad … and I guess I expect more in Copenhagen. Architects and historians often discuss buildings in terms of types so, although there are certainly many general books on the historic and modern architecture of a city or a region or a country, it can often be more useful and more informative to look at, for example, all the churches or all the factories in a town or in a region or discuss the way that theatre buildings or petrol stations, for instance, develop and change over time. For visitors to Copenhagen major buildings in the city like the royal palace or the Opera House or the old warehouses on the harbour are obvious and very good examples of important public and commercial architecture but how many people appreciate that the most common building type in the historic centre, with most examples dating from the middle of the 19th century onwards, is the purpose-built apartment building? And those apartment buildings form the backdrop to most of the major buildings so they contribute much to the visual attraction of the city. I don’t know the actual statistics and percentages but certainly most people in the inner city live in apartments, rather than in self-contained family houses, and the tradition of building good apartment buildings, both as private developments or, from the early 20th century onwards, for large-scale social housing, must be the most diverse and the most significant type of building in Copenhagen and therefore, in reality, the building type that most effects and influences how people live. The city regularly comes out at the top or near the top of league tables for how content people are with their city and their way of life. Obviously there are many reasons for this, including the relative wealth of Copenhagen, efficient local transport, extensive facilities for culture and shopping, good restaurants, bars and coffee places and, of course, the very pleasant urban environment. But high on that list of reasons why people are happy has to be the availability of good housing. In fact I would go as far as to say that the stock of good, well-built and attractive apartment buildings has to be one of the major factors that makes Copenhagen such a successful and therefore such a popular place for its citizens. It is obvious that the availability of good housing has to be a major consideration in any assessment of what makes any city a pleasant or unpleasant place to live but in Copenhagen the quality of housing is significantly more important because of the priority most Danes place on living in a nice home over, for instance, owning an expensive car. Along with the design of the individual apartment buildings, the setting of the buildings is important and the streetscapes of Copenhagen are varied and attractive with apartment buildings set along wide streets, set around squares, laid out overlooking public parks or set along the canals and quays of the harbour. Over a series of posts here I would like to look at the history of apartment buildings from the middle of the 19th century onwards: to look at them in terms of their design and plan and their setting in the urban landscape and try to discuss how the plans and arrangement of the apartments has reflected the way people’s lives in general have changed over the last century or so and also to look briefly at how the plan and arrangement of the individual apartments has influenced the furniture and the decorative fittings that people have chosen. There is clearly a complex relationship between levels of wealth in a city, the style, the size, the cost and the availability of housing along with the individual expectations and ambitions of people and the skill and work of the design and manufacturing industries who supply furniture, light fittings, kitchens and bathrooms for all those homes. A proposal for enlarging the city that was drawn up in the late 1850s, after the outbreak of cholera. It shows in pale grey the area of the old city still, at that stage, surrounded by ramparts but here on the drawing the walls and gates and the Kastellet, which in the end was retained, have been removed and the plan shows the new squares and streets that were proposed in dark grey over the site of the defences and out to the lakes. All those blocks would have been apartment buildings. Many, including those around Israels Plads, were built although, as the development of the area progressed through the 1860s and 1870s, large areas of park - the Botanical Garden and the area around the National Gallery in particular - were left as open public space and the area around a new city hall was not completed until early in the 20th century and that area of the city is now very different to what was proposed in the 1850s and shown on the left part of this plan. Note also how few buildings there were beyond the lakes in what is now the densely built-up inner areas of Vesterbro, Nørrebro and Østerbro. Most of the purpose-built apartments in the centre of Copenhagen date from the last decades of the 19th century and the first decades of the 20th century and their number are the tangible evidence that shows just how rapidly the city grew in that period - in 1870 there were about 180,000 people living in the city but by 1900 the population was 360,000. Some of those new citizens were fortunate and moved into new apartment buildings in the new districts of Vesterbro, Nørrebro and Østerbro … all outside the old city gates and ramparts. Curiously, that building work was not, at first, a response to a growing population and a demand for more housing but was just the opposite - a response to a very dramatic decline in population. The development of the areas outside the old city started because of an outbreak of cholera in 1853 when the deaths of over 5,000 people through a single summer was correctly attributed to overcrowding and poor sanitation and immediately after the outbreak, plans were drawn up to enlarge the city to provide more and better housing so people could move out of the centre. In fact, the huge numbers of new people who began to arrive in Copenhagen, for different but mainly economic reasons, meant, of course, that the rate of new buildings could not keep up. Although many new apartment buildings were constructed, many families continued to live in the overcrowded older houses in the old part of the city and, simply to provide places for all those people arriving, the old practice of building in the courtyards started again, even in the new areas. The population of Vesterbro and Nørrebro grew rapidly and by 1910 houses around Blågårdsgade - poor-quality apartments, built cheaply and quickly only twenty or thirty years earlier and with even poorer quality buildings in the courtyards - was being described as slum housing with serious problems of overcrowding and poor health. It was only with the construction of large new social housing blocks in the 1920s and 1930s, in outer Nørrebro and on the edges of Vesterbro and Østerbro, that the problem with overcrowded worker’s housing was finally tackled. Those apartment buildings have huge open courtyards for air and light at the centre of the block and the only structures allowed in the courtyards were wash houses and so on that were usually only a single storey high so did not block light or fresh air. As for architectural style, the development of apartment buildings in the city is easy to trace by just walking the streets. In the 17th and the 18th centuries large houses would have been subdivided and rented out with families renting one or two rooms and the more affluent would have a series of rooms or even a whole floor but there is rarely anything on the exterior to show how this division of the building worked on the inside. The 18th-century houses are generally plain in form with painted plaster to the front with simple classical features such as pediments over the main doorway and moulded cornices. More elaborate treatment of the windows at the first or second floor will indicate where the better apartments could be found. The best apartments seem to be to the street with poorer and smaller apartments higher up or further back in the courts. By the mid 19th century purpose-built apartment buildings appear with distinct features like a central doorway and symmetrical apartments on each side and an elaborate front staircase marked by more ornate windows, often at intermediate levels, where there were landings. In style this is generally described as the period of historicism so the exterior details became more and more elaborate even if the apartments behind the facade were relatively small. In the 1850s and 1860s many still had a classical restraint with pedimented doorways, pilasters and cornices taking motifs from Italian Renaissance buildings but slowly more and more ornate French-inspired facades appear with turrets and domes and some look to north Germany and to Danish architecture from the 17th century with the appearance of mullions, ornate brick work and shaped gables. In the period around 1905 to 1910 there was an economic downturn and many of the new apartments were vacant and building work slowed down. Then, from 1920 and with the expansion of the docks and industry in the city, there was a severe shortage of housing for workers and that was when building large-scale social housing begins. In style there was a return to a stripped-back classicism with building in brick and the design relying on simple but good proportions which in the larger apartment buildings can look quite severe. Clearly the restraint was more to do with keeping down the cost than with aesthetics. Through the 1930s and 1940s balconies become a common feature - across the street frontage as often as towards the courtyards so reflecting that well-established tradition of having the best rooms towards the street. In the second half of the 20th century materials change to concrete and steel and windows are much larger but the communal courtyard; the through apartment, with windows to the front and rooms to the back, and a series of entrances and staircases along a block rather than a single entrance and internal corridors is still the common form and tower blocks are rare. In the building boom from the 1990s and on, the plan of apartments changes little although penthouses have appeared and some exteriors have become much more extravagant and dramatic although, perhaps in reaction, some architects have returned to the restraint of the 1930s with plain white facades and balconies with rounded ends. This series of posts (below) has been about the development of apartment buildings in Copenhagen … in part because I live here and can wander the city taking photographs but also because of the number and range of apartment buildings in the city. However, an assessment much like this could be undertaken in Stockholm or Helsinki where apartment buildings also dominate and are a major part of the housing stock and, for social housing in particular, many important modern or experimental ideas about planning appear first in Stockholm or Malmö. On the main Copenhagen site there is a gazetteer or time line with major examples of apartment buildings in the city from each period. When I tell Danish friends that I love the courtyards of the city they tend to become serious, slightly dour, and suggest that if I did but know and then talk about ‘third courts’ and ‘fire courts’ … courtyards that were within courtyards that were within courtyards so courtyards three in from the street and dark and damp and a very real fire risk, hence presumably the name, and many remained like that through into the 1960s or 1970s. Some of the courtyards, particularly in the 18th-century part of the city, were large and filled with gardens and others had the stables and carriage houses of the grand residences along the street frontage. Some courtyards, particularly in the older parts of the city, had store rooms and workshops but many were packed tightly with buildings that were crowded with people renting just one or two rooms and the alleys and courts could be dark, full of washing and stench, and with little light or air reaching the lower rooms. Photographs from the late 19th century show washing strung across from side to side, ladders and carts, timber piled up and channels in the cobbles to take away water and worse. Water must have been drawn from wells or come from fountains and pumps in the street. If you are curious to seek out the street, the buildings there were demolished sometime after 1900 and if the ghosts of the women and their pimps are to be seen anywhere it will be in the Danish Film Institute built on the site. So just how densely packed with people was Copenhagen? In the 1840s - so shortly before the outbreak of cholera in the city - the population of Copenhagen has been calculated to have been about 120,000 people but of course then Copenhagen was much smaller than now - just the inner city, the new town around the royal palace and Christianshavn. Both the latter areas were relatively spacious with large houses and both Holmen and Gammelholm, south of Kongens Nytorv, were working docks and ship building yards so few lived in those parts. It is difficult to find the figures to compare like with like but the old city from the east gate, by what is now the Hotel Angleterre, to the west gate, close to the city hall - so the length of what is now Strøget or the walking street, is about a kilometre and from north to south, from Nørreport to Gammel Strand, the old quay, was only 750 metres and the irregular shape meant that the area was much less than a square kilometre although, even in the 19th century, there were some large squares, some broad streets and of course public buildings. There were probably getting on for 100,000 people living in that area. To give that some context, the most densely-packed area of modern Copenhagen is Inner Nørrebro where the most recent figures suggest that 31,000 people live in an area of 1.72 square kilometres … so in the centre of Copenhagen in the middle of the 19th century, at the time of the cholera epidemic, there were more than three times the people living in less than half the space. And that was at a time when there was no running water and no sewerage system. If I have just alienated all my Danish friends by implying that their beautiful city was some sort of seething slum in the 19th century, then I would hasten to point out that parts of Paris, much of east London, large parts of Hamburg and Amsterdam were just as densely packed with people at that time. To placate Danish friends and alienate French friends I would also point out that in Paris the authorities feared revolution in their overcrowded city so, in the middle of the 19th century, demolished densely built-up areas and laid out wide new streets, the boulevards, in part so they were too wide for people to build barricades and so that troops could be moved quickly around the city to quell rebellion while at the same time the authorities in Copenhagen decided that one good way to stop a revolution was to keep Tivoli where the workers of the city would be entertained and distracted. To placate my working class friends and alienate my middle class friends I would suggest an interesting but impossible social experiment: 103,000 people live in Frederiksberg - now seen generally as the poshest part of the outer city - so just about the same number as lived in the centre of Copenhagen in the middle of the 19th century, although they have about 12 square kilometres of space. It would be fascinating to see how they would cope if they all had to move into the central area of the city with something like 8% of the space they have now. To be rather more serious, Jan Gehl - who has done more than anyone else to analyse the plan of the city and its history and look at how it now functions - thought that because so many people live in the centre of Copenhagen - more than in most European capitals - it feels more friendly, more open and more secure at night. He calculated that in 1995 there were 6,800 people living in the centre and I can’t believe that figure has changed much in the last 20 years so less than 10% of the population 150 years earlier. You can see why people had to build over the gardens and courtyards in the old part of the city. As the population increased but with the boundary of the city clearly defined and building beyond the defences impossible, taller and taller houses were built on the street frontage and other houses and workshops and so on built in the gardens and back plots behind the houses that fronted onto the street. All fairly obvious and certainly not unique to Copenhagen. But what I like about the courtyards is not necessarily for what they were, although for a social historian they are fascinating, but, as they have been cleared, for what they have become. On many of the blocks buildings within the central area, behind the street frontages, have been cleared and property boundaries ignored to form large green spaces that are in most cases hidden from the pavement. They form a private outside space for all the families that live in apartments around the edge of the block. In the best, there is a strong sense of community with picnic tables and chairs, barbeques and children’s play equipment common and well used and rarely abused. 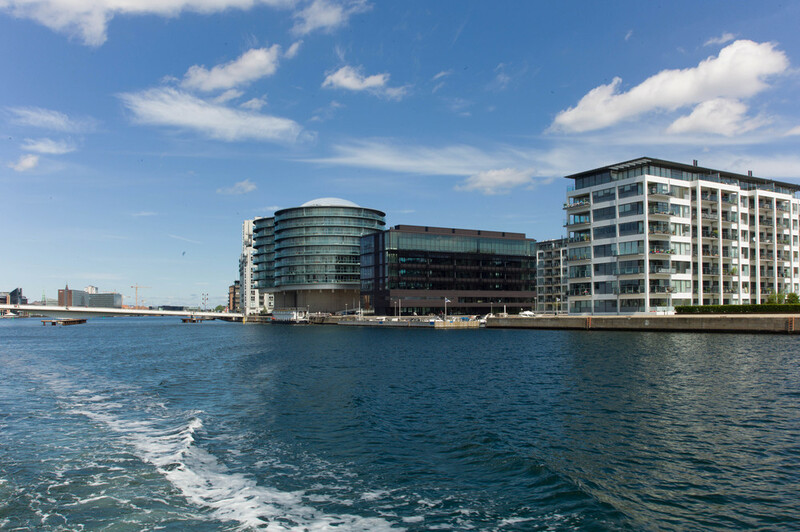 The model is so established and so successful for high density accommodation that new apartment buildings follow or imitate the form … so apartment buildings of five or six stories facing inwards to communal gardens can be seen in new developments around the harbour including Nordlyset in Amerika Plads and Sluseholmen. Perhaps the only real problem, in terms of townscape, is that in some parts of the city, particularly where the city blocks were long and narrow, apartment buildings along the street frontage itself have been demolished and the land left undeveloped to bring sunlight and air into the backs of the remaining buildings. It is obvious why this was done but in many cases it makes the courtyards too open - too exposed - and it can undermine the line and form of the street and certainly exposes the backs of buildings that were never meant to be seen. Most of the older buildings in the city have expensive fronts to be seen and very practical and simple or cheap and muddled but practical back elevations. 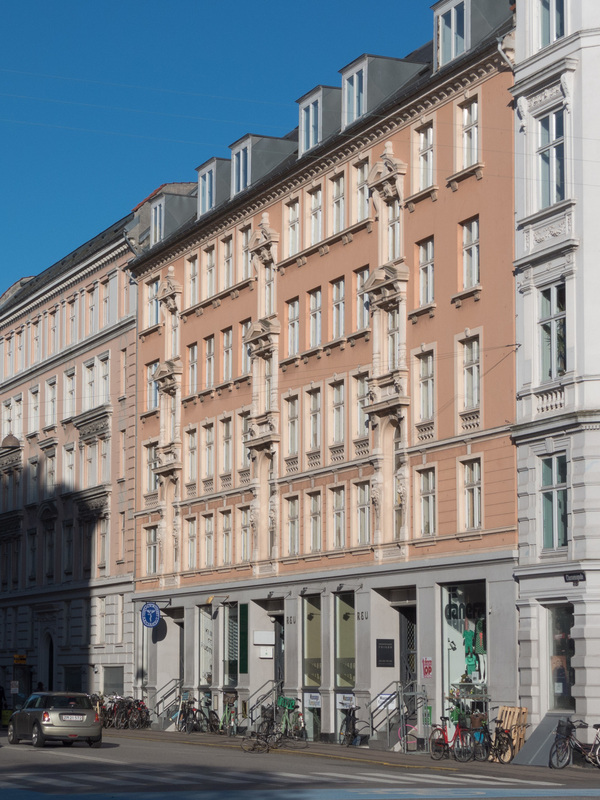 Completed in 1893, according to a plaque on a parapet, Skydebanegade is an ambitious and theatrical housing scheme with a complicated plan for apartments in buildings on both sides of a cross street that runs between Sønder Boulevard and Istedgade in Vesterbro. The development was presumably speculative, by a builder called Victor Jensen with the design from an architect called Oscar Kramp. 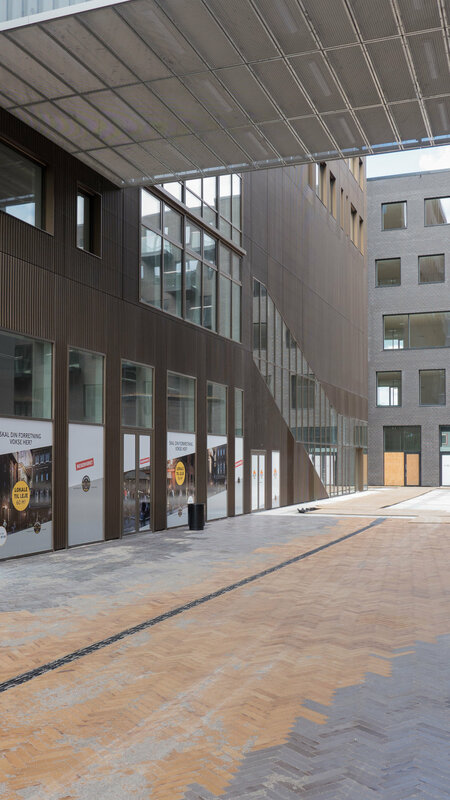 The street is only about 180 metres long but by pushing back deep narrow open courtyards running back from the street into the facade, with three set backs on each side, the entrance frontages are increased significantly in length- from 180 to 375 metres on the west side. This is not a unique arrangement in the city - deep open courtyards are used as a form of planning in several buildings in Jægersborggade - but nowhere else is it used in such a coherent and dramatic way. If that was not complicated enough, the plot is not actually rectangular because the main streets in this area fan out at different angles, from the centre of the city and the street is aligned on the gate into the Shooting Gallery Park, rather than being set down the centre of the plot, so to maintain the appearance of symmetry from the street on the city, or east side, at the Sønder Boulevard end, there is a curious return frontage to a wider set back, that creates an oddly-shaped courtyard enclosed with fronts on three and a half sides. This is what might be described as a very clever bit of design fudging - not an official architectural term but a fairly common practice because in buildings on this scale, the human eye can rarely take in what is at an angle or what is exactly the same width on opposite sides of a street. What it does show is a clever design mind in the 1890s where apparent symmetry and apparent grandeur were overriding considerations for the final scheme. At both ends of the street, the facades return and run for a short distance along the main roads, along both Sønder Boulevard and along Istedgade, in both directions. Again each of these ranges is different in length - reflecting the skewed trapezoid shape of the plot. Fronts onto the main roads have the same architectural treatment as the facades facing the cross street. The insets on the east side of the street are 23 metres deep while those on the west side are all different - the inset closest to Istedgade is about 27 metres deep, the central recess 33 metres deep and the south inset before Sønder Boulevard 36 metres - reflecting the different depths of the plot on each side of the street. As a consequence, the courtyards behind the apartments on each side of the street are very different. Those courtyards are entered through archways at the centre of each main element along the street frontage. Strong polychrome is used effectively in the grand design of the street facades with a dark grey ashlar for a ‘base’ on the ground floor; bricks laid to imitate ashlar on the first floor; a giant order of fluted pilasters through the second and third floors and the order continues, above an intermediate cornice, through the fourth floor. There are decorative terracotta panels, between the windows of the third and fourth floors, and throughout good decorative plasterwork. External angles of the open courtyards and the ends of the ranges where they return along the main roads are angled, rather than square and at the centre of the street are treated like pavilions with faceted spires at the four corners to form a centre to the composition, creating what are read as pavilions externally but internally, in the arrangement and plans of the apartments, are no different. This is theatre-set architecture at its very best. Such grand architecture implies grand apartments although, in fact, the apartments here are relatively small. There are doorways from the street and in the recessed courts, 48 separate entrances in all, including entrance doors on Istedgade and Sønder Boulevard, and each gives access to a lobby and staircase with apartments on each side and all the apartments have back service stairs down to the courtyard from the narrow back rooms, originally the kitchens. Apartments facing into the recessed bay elements are small with a single room to the front and two narrow rooms towards the courtyard, presumably a bedroom and a kitchen and there are larger apartments in the ranges directly along the street and in the angles. When first constructed the apartments would have had toilets and washhouses in the courtyards. In line with Skydebanegade, on the far side of Istedgade, is a short street that ends in the high, brick, screen wall of the Shooting Gallery - the Skydebanen that gives the apartments their name and on whose land the apartments were built. The buildings were restored and upgraded in the early 1990s with new heating and some apartments were amalgamated to form larger units. The large courtyards behind were cleared of buildings and new gardens planted. What should also be noted is the high quality of the hard landscaping of the street and the good lighting installed. This has ensured that a major architectural feature of the area has been retained in the housing stock in the most positive way. Small shop units along the street, including a launderette and very pleasant cafe, all contribute to give the street a very strong sense of community. Demolition of buildings within the courtyards behind the Skydebanegade apartments is interesting because of the size and extent of the buildings removed and the dramatic effect that had but it should not be taken as typical for one rather curious reason: the Skydebanegade apartments benefitted enormously from the work even though the courtyards were not actually on land that they owned originally. The distinctive zig zag plan of the apartment blocks, with alternate open courtyards to the street and between them open courtyards to the back forming an outline that looks almost like a Greek key fret pattern, was built right up to the east and west boundaries of the land acquired from the shooting gallery. The courtyards actually belonged to the properties facing onto Absalonsgade to the east and Dannebrogsgade to the west. Some of the large buildings in the courtyards may have been workshops and there were certainly stable buildings shown in the east courtyard that was accessed from Absalonsgade - two smaller stables with four stalls in one and 11 stalls in the other but there was also one long range which seems to have had a central passage way with 15 stalls on each side and a large yard to the front so there were, possibly, 45 horses in all kept in the courtyard with all the noise, smell, and manure that would imply. The stable with four stalls appears to have two carriage or cart sheds adjoining so may have been used by a carrier or delivery man. Riding horses and carriage horses might well have been kept in some courtyards. One advantage, though possibly on balance not a great advantage, was that there would have just been hay lofts above the stalls so the buildings would not have been that high so would not have cut out much light to the buildings around. Long thin buildings shown in the narrow courtyards of the Skydebanegade buildings were presumably toilets - the plan here is at first-floor level or above as the archways from the street at ground level are not shown - so the narrow strips of building are drawn as if looking down on the roof. In the apartment buildings themselves, there are small square, unlit, internal rooms shown close to the secondary or back staircases and these might have been inside toilets and possibly shared between several apartments but given the date of the building, completed by 1893, inside toilets and toilets flushed by water are not likely to be an original feature if only because the very first flush toilets in the city are said to date from 1893 and were in apartments in the much much grander street of Stockholmsgade in Østerport. When the buildings in the courtyards to either side of Skydebanegade were demolished, a range of smaller apartment buildings facing along Dannebrogsgade were also taken down and not rebuilt leaving the courtyard on that side open to the west. It is difficult to calculate from just the plan but counting the staircases in the demolished buildings with apartments on both side of each landing, and assuming that there were almost-certainly five stories to each range, then around 300 apartments were demolished when the courtyards were cleared. With the new open spaces of the large courtyards many of the apartments overlooking them were given new balconies. The gardens are laid out with different small areas of planting to enclose picnic tables, children’s play equipment and shelters for bikes. Planting, areas of raised ground and carefully planned and well laid paths and paved areas add considerably to the attraction of the space which, as with so many of these courtyards, provides an oasis of calm just off the busy and noisy streets. Work on the courtyards and on the restoration and upgrading of the apartments started in 1989 and was completed by 1996. In a densely built up residential area like Vesterbro, natural planting of grass and trees is important, not just in larger open spaces for recreation and relaxation but in smaller areas to break up visually the mass of masonry, brick and tarmac. At the centre of the area is Skydebanehaven, a large rectangular space surrounded by the backs of buildings so that it is more like a large courtyard. It is on the site of what was a private shooting range so presumably it was originally open ground with gravel or grass but now has a large number of mature trees. At the south-west corner it has been opened out to adjoining streets with the demolition of some rows of slum housing but it still seems like a well-kept local secret that is hidden away behind apartment buildings and, from the Istedgade side, is entered through a doorway in a forbidding high blank brick wall that closes off a short street of apartment buildings. The other large area of grass and trees is Enghave Park at the far west end of Vesterbro laid out in 1929 specifically as an open area with large apartment buildings of that period on the north, west and south sides. More recent is Saxopark - a long strip of garden created when slum houses to the west of Skydebanehaven were demolished, courtyards cleared of tightly-packed infill and a line of new apartment buildings were constructed. Halmtorvet and Sønder Boulevard, its extension west, which run across the south edge of the area was a major road for traffic in and out of the city. As part of a concerted plan to improve Vesterbro, the far end of the road was closed to traffic and the roads, now restricted to local traffic have been reduced in width and the central area of grass widened for space for seating, picnic tables, sports equipment and new play areas for children. The city end has extensive areas of water with fountains, areas for seating and cobbled and gravelled areas used for flea markets, food fairs and other events. Close to the Meat Market area, also being improved, the remodelling of the street has encouraged new restaurants and cafes to the area and most now move seats and table outside to the pavement. There are also relatively small squares through Vesterbro with mature trees in front of major churches - including the Eliaskirken facing onto Vesterbrogade, the church at the east end of Litauens Plads, almost in the centre of the area, and Kristkirken on Enghave Plads on the east side of the park. Towards the west end of the area the cross streets are wider and several are set at an angle so they create triangular areas at the junctions with the main roads which are now also being used for outdoor seating for cafes and for some planting. Of course, as with other parts of the city, courtyards behind the apartment buildings, provide important enclosed, private areas of garden but in this part of the city the courtyards within the blocks tend to be narrower and smaller although the east courtyard of the Skydebanegade apartments is almost as large as Saxopark and there are some larger courtyards in the blocks along the south edge of the area close to the main railway tracks. From January through to April this year there was a major exhibition at the Danish Architecture Centre under the title The Rain is Coming. It looked at climate change and the impact that will have on the architecture and planning of our cities. The conclusion was that climate change is happening already and that planning has to take that into account now but it can be seen as a way of making positive changes. It is fairly clear that for Denmark the climate changes will mean more rain and more intense storms and that drains and roads will not be able to cope with the sudden inundation of water. I have actually experienced this … shortly after I moved to Copenhagen there was a massive rain storm; the street drains backed up and the road and pavements were flooded and water streamed down into cellars. Further along the street many of the buildings have semi basements so there is half a flight of steps up to the entrance and main floor but short flights of steps down to a semi basement that in many buildings are used for shops or workshops. Many of these businesses were severely disrupted by the flood … water had to be pumped out, property dried out and in many cases floors relaid and walls re-plastered. At least one of the businesses is still closed a year on. There are straightforward solutions that are being implemented throughout the city and in new developments. Many streets are being dug up to install more robust drains to replace simple gutters. These have a large buried concrete channel covered by a continuous grill rather than a gutter that drops water down into a drain at intervals. In some areas, permeable surfaces are now being installed so water will percolate down between cobbles or down through artificial playing surfaces on sports areas rather than sitting on the surface or flooding across to overloaded drains and well-planted ditches or hollows will be attractive green features for most of the year but will become streams or ponds when there is heavy rain. Several major drainage and landscape schemes are now under way around the city. With so much land covered with buildings or roads there is less and less chance of water soaking away but if it is allowed to run straight into drains then they fail and can also compromise or damage the sewerage system with obvious consequences. The schemes are designed to hold back rainwater so that it can be released into the drains in a controlled way after a storm. Through much of its history the inner harbour in Copenhagen was a working port and naval dockyard. There were some houses on Gammel Strand, the houses of merchants, and houses along Nyhavn and facing onto the canals in Christianshavn but until the beginning of this century most of the buildings directly on the quayside of the inner harbour itself were warehouses, customs buildings, factories and the yards and buildings for the navy along with some major ship-building yards. The first major purpose-built apartment buildings that overlooked the inner harbour itself were built in the late 19th century along what is now Havngade between the canal and Nyhavn when this land, a large triangle south of Kongens Nytorv, was made available with the move of the naval dockyards from here to Holmen on the other side of the harbour. 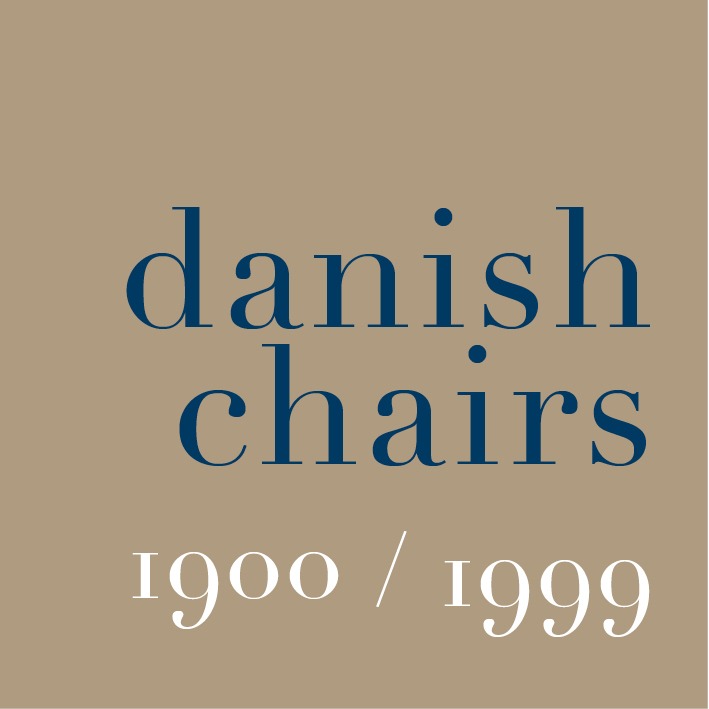 Around 1900 substantial blocks of apartments for workers were constructed on the Amager side of the harbour below Stadsgraven and the western-most of these overlooked the harbour and some modern blocks were constructed along the harbour side of Christianshavn. The real change however began in the late 20th century as ship building and many of the facilities for the navy and factories and commercial warehouses in the inner harbour were rationalised, closed down or relocated. Substantial historic warehouses have been converted to apartments and new apartment buildings constructed particularly to the south on either side of the harbour and also north on the quays of the Old Free Port, north of Kastellet. Further north work is ongoing to transform the area of the North Harbour and, beyond that, there are new apartment buildings around the site and wharves of the site of the Tuborg brewery. Most of these new apartments overlook former harbour basins or are actually built on former harbour quays. As yet there are few new apartment buildings overlooking the Øresund itself although there are some new buildings close to the metro stations at Øresund and Amager Strand. Overall, this may not sound like substantial development until you look at the map and calculate some distances. If you take the inner harbour to be from Nordre Tolbod to the southern bridge Langebro that is nearly 2½ kilometres (1.5 miles) but from the bridge on south down the harbour to the new development of apartments at Sluseholmen is over 3 kilometres (2 miles) with major developments of apartment buildings on both sides and from Tolbod north to the quayside at the former Tuborg site is well over 4 kilometres (nearly 3 miles) and that basic distance doesn't show just how much land is being reclaimed at Nordhavn - the North Harbour - for new apartment buildings. 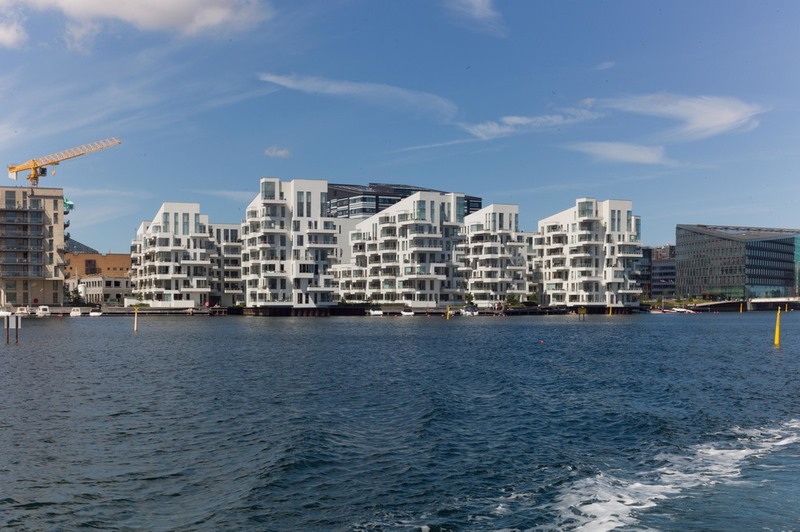 New apartment buildings at the south end of the harbour at Teglholmen. They follow a traditional form with apartments looking inwards into a large courtyard laid out with communal gardens. In Groundbreaking Constructions - the current exhibition at the Danish Architecture Centre in Copenhagen - one of the main sections is on housing. Each section has one main example of the type - the other sections being Industrial Constructions, Infrastructure, Public Buildings and Culture - with a video about the site or structure. 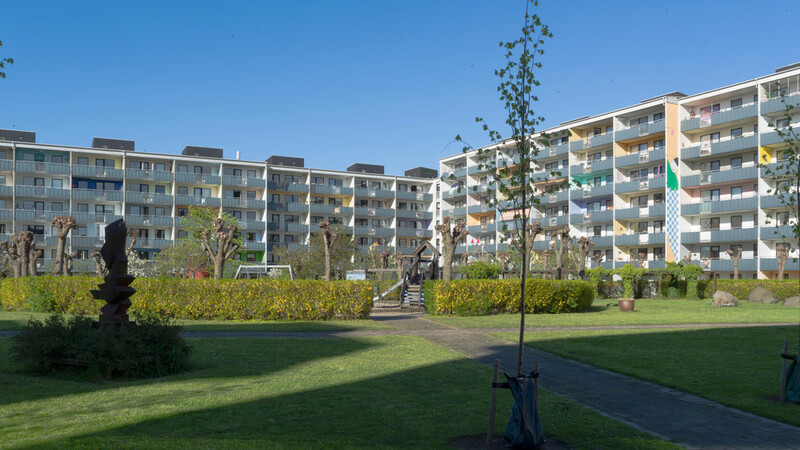 For housing that main example was the housing scheme at Søndergårdspark constructed between 1949 to 1951 for the Danish Public Housing Association and designed by Poul Hoff and Bennet Windinge.. Initially this appears to be curious as the design is hardly groundbreaking in terms of either style or construction method. Plans of the single-storey houses and their general appearance can be seen as a fairly straightforward development of the plan and the style of the houses of the Studiebyen housing quarter of 1920-24 or the Bakkehusene housing scheme of 1921-23. What is important at Søndergårdspark was the large open public area at the centre, like a village green, with very little space given to private gardens for each house … just a small area of planting at the front onto a foot path and a square area at the back without walls or heavy fencing but with shrubs and trees providing some privacy. There were three basic forms of house with detached houses on either side of the green with pairs of houses linked by a wooden structure or shed. There were row houses or short terraces to the west of the green but on a similar plan internally and then further to the west, beyond a service road, lines or rows of slightly larger family homes of one and a half storeys with attic bedrooms. All the houses were carefully orientated to take maximum advantage of the sun with access from a footpath across the north side of each short row and the main rooms with large windows facing south. The area was ostensibly pedestrian and had a short parade of shops at the top corner near the main access from the road and on the way to or from the suburban railway station. This was the first public housing estate to give such prominence to the landscape setting - designed by Aksel Andersen. In the housing section of the Groundbreaking Constructions exhibition there are a number of apartment buildings including the first high rise housing in Copenhagen … the 28 towers of Bellahoj that date from 1951-56 and so almost contemporary with Søndergårdspark but taking a very different form with 1,300 flats in 28 towers varying in height from nine to thirteen stories. 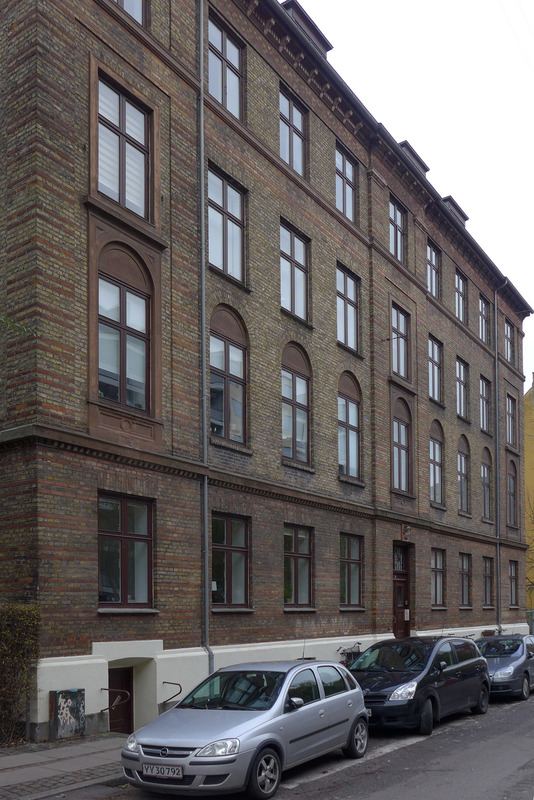 Very large apartment buildings for public housing had first been constructed in Copenhagen in the 1920s as a response to severe housing shortages immediately after the First World War. Hornbækhus at Borups Allé, designed by Kay Fisker was completed in 1923. Vestersøhus, also by Fisker but working with C F Møller, is also included in the exhibition. It was completed in 1939 and had 242 apartments, ten shops and a hotel with 43 rooms. Fisker again but working with Eske Kristensen designed the Dronningegården and Christiansgården blocks that were completed in 1958 for a very extensive urban renewal scheme with road widening and the creation of a new square with four L-shaped blocks and again with shops on the ground floor. These post-war buildings move away from the earlier Copenhagen arrangement for apartments that were generally built around a large open communal courtyard that was generally landscaped but included areas for drying clothes. The exhibition includes two recent and major housing developments with the VM Bjerget building of 2008 and the 8 Tallet of 2010 … both on Amager and both designed by BIG … the Bjarke Ingels Group. The first rejects the type of apartment building with a single rectangular block, using the layout of a V and and M shape to give maximum light and views out for each apartment and the 8 Block returns to the courtyard form but uses levels and mixed use in a much more ambitious and imaginative way.